We left the Granary burial ground and followed the red bricks in the pavement left along Tremont Street. Ipswich streets at eye level can look fairly uninteresting, but crane your neck a few degrees upwards and you’re likely to discover something special. This was also the case in Boston, proven by an unusual building that caught my eye as we left the cemetery; the logically named Tremont Theatre. The ground floor is a series of unexceptional arched windows, above which is a row of Romanesque arches reaching across the middle of the frontage between two small balconies. Looking further upwards the next ten or twenty metres of the front of this great building was solid brick, set in diamond shapes. Between the Romanesque arches just above street level to two stories of windows at the very top of the buildings there are no windows, just this expanse of ornamental brick. There are no windows, but right in the middle is a small balcony, protruding from the middle of the building like a sulking mouth. Accompanied on either side by modern tower blocks this building looked entirely out of place, like a beauty queen standing in line at a knobbly knees competition. I had no idea what this building was called until a few months after I returned to England. I was ploughing through the hundreds of photos I took on my trip and the photo of Tremont Theatre leapt out at me, but I had no idea what the building was or what it was called. I wrongly guessed that it was a Synagogue. I posted a photo of the theatre on the photo sharing website Flickr, with the caption ‘can anyone tell me what this building is?’ Within hours a fellow user going under the name ‘sw_awesometown’ gave me the building’s name and a helpful link to find out more. It turns out although I was wrong about it being a Synagogue I was in the right ball park, ecumenically speaking. 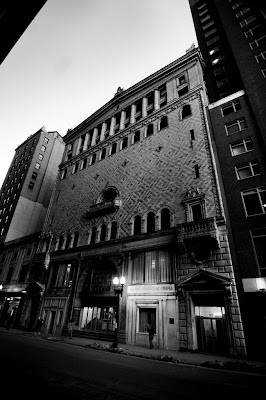 Built in 1827 as a theatre it was bought a few years later (in 1843) by the ‘Free Church Baptists’ and renamed Tremont Temple. Between then and now it has burnt down a remarkable three times. Debunking the myth that Americans don’t get Irony, someone staged the play ‘The Burning Fiery Furnace’ there in 1985. The staging of this play gives me a tenuous and coincidental link with the building; the play was written by Benjamin Britten, who lived in the town of Aldeburgh, a handful of miles from where I grew up. In another tenuous twist Benjamin Britten died in 1976, the year I was born! This proves two important facts, the first being that stopping and absorbing your surroundings (albeit with a little research) can reveal some fascinating facts. Secondly this episode illustrates how ready we are to celebrate coincidences, the history of mankind is so packed with detail you’re bound to find links and coincidences wherever you look. Take for example what is possibly the most tenuous link between myself and the Tremont Theatre, it was opened by the British comedian Charles Wyndham, I too am British. Charles Wyndham gained critical acclaim for playing a part in an adaption of ‘Saratoga’ on stage in Brighton, My travelling companion Sam lives in Brighton. Wyndham was also a trained surgeon, and early in his career he gave up on acting for a bit, there was a shortage of surgeons in America (thanks to the civil war) he readily found work in the Union Army, Abraham Lincoln’s army, our host Jim has a dog called Lincoln. A fairly facetious (but wholly true) example, but it proves a point! Proof my cats can fly! What started off as filming my old lady cats dealing with a young upstart intruder ended up with me filming my flying cats. I took photos of them 'flying' off this roof about a year ago and loads of people assumed I had thrown them, which of course I wouldn't dream of doing. So watch this video, and you'll see they fly quite readily of their own accord! Good news everyone, it's okay to have two drummers again! Until just a few weeks ago knowing a band had two drummers would give me a similar bad feeling to knowing I needed root canal surgery, and could only have that surgery under the influence of food poisoning and the flu. Then my good friend Sam introduced me to the Melvins. Put out of your mind any notion or memory of the crimes against drumming the likes of OMD committed in the past. Cast asunder the uncomfortable memory of Phil Collins stuffing up the Led Zeppelin comeback at Live Aid in 1985. Wipe clean your multi-drummer memory and bathe in the glory of The Melvins. Ignore the fact they’re allegedly a heavy band, open your mind to new percussive possibilities and marvel and two drummers creating one drum sound. Journalist Sam L Page and myself (Andrew Culture) nipped over to a mate's house in Dartmouth MA to say hullo then drove down to Washington for the Obama Inauguration. We're writing a book about it at the moment, but in the meantime here's the road trip video. We stopped off at places like Boston and Foxwoods Casino, and found out that most of the North of the country was hidden under snow. I jammed a 35mm film in my medium format ancient Kodak Duaflex. 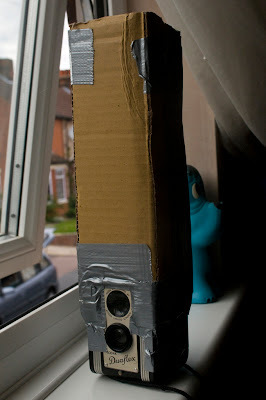 It looks like I didn't put enough gaffer tape on the red window on the back of the camera body! The subject of the first photo is quite perfectly my sister, I often get that look from her when faffing about with cameras! This is also the first bit of negative I've scanned on my new Epson 4490 scanner, I want to get some glass so I can make my own negative holder so I can get the full frame, shooting 35mm in a medium format camera means the entire width of the frame is exposed. As you can probably tell I've done no post process on this! As much as I dearly love my fancy pants Nikon D300 digital camera I’ve recently become interested in old film cameras. After getting used to the amazing amount of control a modern camera gives me I wanted to have a crack and something far more rudimentary. 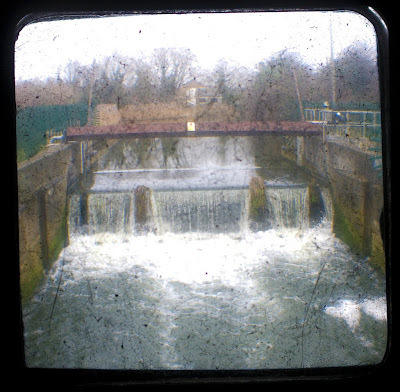 I bought a 1950s Kodak Duaflex and took some photos through with my digital camera using the contraption you see below. Sticking a digital camera in the top of the tube allows you to take photos off the ground glass viewfinder on the top of the Duaflex. I decided to go one step further and this is how I managed to run a reel of 35mm film through my old Kodak Duaflex. Getting the 35mm canister to sit in the film bay was pretty easy, I just used a couple of bits of foam to hold it in place. 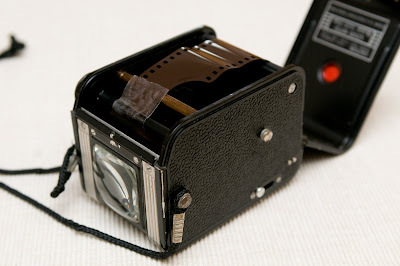 I then taped up the red window on the back as 35mm film doesn’t have backing paper like 120/ 620 film. Working on the basis that five complete turns of the old 620 spool would be roughly a frame I only managed to get five frames out of a 24 exposure reel! 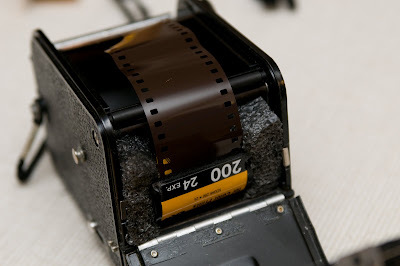 To get the film back into the container I had to pop up into my loft at night time and open up the back, and manually reel the film back into the 35mm canister. I did this after an evening of wine and dinner with my family, so I'm not too sure how accurate I would have been, in fact I'm just relieved I didn't fall down the loft hatch! 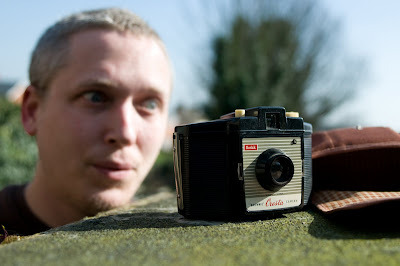 My friend Graham has taken the films to the local Crappy Snaps to get developed. He's asked them not to cut the film, I'll need to do that as I have no idea where the images will be on the film! He has also requested that they don't make prints, as I'll do that using my scanner. I’ll post the results when they come back from the lab! Next up is my Kodak Brownie Cresta, it arrived just this morning and cost only three quid off eBay! I've got some 120 film on the way and can't wait to run some through this beauty! “I know, I know, I know, I tried, I know,” he’s heard saying, while in the aural foreground a thick accented Yorkshire man loses his temper and squeals like a banshee while accusing the leader of the country of personally destroying his life. In line with a string of previous callers this Yorkshire man is furious that his company is going bust for want of bank funding. Echoing millions of British voices he wants to know why the banks haven’t held to their word. How can these financial institutions be allowed to block small business funding when the funding given to them by the government was handed over on the very condition that they passed on the support? Just as he was reaching a Zenith of abuse the caller is cut off, the presenter offers the palliative that they appear to have ‘lost that caller’. The producer sits wide eyed behind the control room glass, signalling wildly to the presenter that there is a seemingly endless line of people ready to abuse the premier. Another caller comes through, and the agitation rises to a fever pitch and personal threats of violence are made against the still silent Prime Minister. Hearing the voices of the callers as if he were in a coma he thinks back to an extraordinary meeting he had with the Queen a few days before. Despite spending decades as little more than a tourist attraction the Queen sternly reminds the Prime Minister that she still holds ultimate power over government. With a grim face and eyes as cold and hard as steel she warns that unless the situation improves she will find her hand forced, for the protection of her people. She makes the ultimate threat, she will dissolve parliament. She is not alone in her grave alarm, for the first time in many years her people are listening to her increasingly frequent public addresses, and nodding in agreement at her surprisingly aggressive rhetoric. Interrupting yet another livid caller the Prime Minster yelps like a stuck pig and stands up suddenly, sending his chair wheeling back across the studio, knocking over a stack of books on a far table. In the control room the producer has also sprung to his feet, behind him stand the solemn figures of the deputy Prime Minister and the station controller. The controller can be seen whispering in the deputy’s ear with some urgency, the deputy has his head bowed and is slowly shaking it from side to side. The Prime Minister paces the room, clenching his fists and raising them up and down by his sides like an ape on parallel bars. Cutting off the current caller the presenter pads the dead air with recaps of what the previous callers had to say, while looking desperately for guidance from his producer. His producer is oblivious to his presenter’s desperation, he is looking the other way, making a cut throat motion to his controller and shrugging his shoulders so high it looks like his head may retract into this rib cage. This outburst from the Prime Minister takes everyone by surprise, for what seems like an incredibly long amount of time all is silent in the studio, in the control room, and in every radio fed room in the country. Listeners at home hear an almighty crash as the Prime Minster kicks over a low table, sending branded mugs of lukewarm coffee flying across the room into the heavy studio door. Throughout the country millions of buttocks simultaneously clench. Families, lovers, work mates and even the studio staff look at each other with stern concern in their faces. Like a bully that has pushed a victim too far, everyone feels momentarily sorry for the Prime Minister. An apathy laced with fear, for what may happen if the bullied child pulls out a knife? The nation listens as the Prime Ministers heavy footsteps grow louder, announcing his return to the microphone. He pauses, waiting for response, one not forthcoming from the few people gathered around him in this dimly lit studio complex. The presenter makes well rehearsed excuses about being out of time, and the programme goes off the air, leaving a nation reeling. A week later each person in the country does indeed receive £25,000 to do with as they wish. For a few weeks everyone lives in what feels like a golden age, teenagers cruise the streets in brand new cars, jewellery shops sell out of stock, and hundreds of thousands of people pay off their mortgages. It takes some time for people to realise that the Prime Minister may not have acted in the best interests of the nation, but has acted with all the spite of a harshly disciplined child. Due partly to the overwhelmingly positive mood this cash injection instils in the nation the first few cracks go un-noticed. Over the course of a month nearly 100,000 heroin users die of overdose. People that frittered their money away become violently jealous of anyone that still has a surplus of money. Those that dutifully paid their money into a bank despair as the bank goes out of business, sucking their cash lifeline into a large black hole of epic debt. In the following weeks the financial fabric of the country rips and comes apart completely. British inflation starts to out pace even Zimbabwe. Britain is excluded from the European Union and barred from the common market. France becomes so terrified of the madness spreading that the Eurotunnel is sealed. Inflation continues to skyrocket and starts to dwarf the rises seen in Germany during the 1930s. Within a few months anarchy is new master of Britain. People cower in their homes, listening out for slowing footsteps from behind barricades, dreading the day the footsteps pause outside their home. Just hours before Buckingham Palace falls to the mob, the Queen disbands Parliament and the country descends into fractured and bloody civil war. A perilous u-turn indeed. This story was inspired by Prime Minister Gordon Brown taking phone calls from the public on the BBC Radio4 programme 'You and Yours' on the 10th March 2009. I've been reading a rather special P.G.Wodehouse collection bought for me by my parents recently. I've seen (and own on DVD) all the Jeeves and Wooster stories but had never actually read the written word. It's the reading equivalent of a beautifully sung and gleefully catchy song. Each sentence rolls along with such a smooth slide that you'd think the author spent hours making it just so. It's true that Wodehouse loved musical theatre, and reading his written word really bares that out, but by all contemporary accounts this style of writing came quite naturally to the good man! JEEVES (holding a hat), "I assumed this got into your wardrobe by accident, or was placed there by an enemy?" WOOSTER, "But I bought it in Cannes!" JEEVES, "and wore it sir?" The humour is so delightfully subtle that if you're not paying attention you won't get it, something that a lot of modern script writers could learn a lot from. I hope in my writings I am unafraid of subtlety and never take the short cut to an easy laugh. Sir Wodehouse, I salute you! As I stare down the perfectly straight road towards the grey blue collapse of the horizon I find myself replaying a familiar inner monolog to reassure myself I am doing the right thing. We all have these inner voices, of reassurance or doubt. I’ve never felt anyone could be hearing the same topics of self cancelling self doubt and reassurance that came to me on these endless car journeys. But then we all like to feel unique. It’s the very nature of long distance driving in America that draws me back to this land, as if I were connected by a cerebral elastic band. While most people dread the long hours of solitude on these featureless roads I savour them, they are the serene ying to the maddening yang of my life back in England. Here I am anonymous, another corpse in waiting, hurtling through the countryside in a mass produced godless tin can. Nobody here will judge me based on my family name, a name that brings so much prejudice and unwanted attention at home. In fact the very word home has become a shallow lingual token to me. My family’s money affords me the cash to own several homes, but I haven’t had a fixed address for many years now, I saw each place I lived as nothing more than a brick box in which to accumulate material objects I had no love or need for. But what is a curse for me in England fuels and funds my time spent wallowing in anonymity elsewhere in the world. My inner monologue assures me that I’m doing the right thing, I didn’t choose my name, it was thrust upon me and I refuse to allow any external public pressures to guide my path through life, and so here I find myself.